JUDGE ED EMMETT delivers the Keynote Address and swearing in of the board, at the Annual Meeting of the Greens Bayou Corridor Coalition. Also speaking were Greens Bayou Corridor Coalition (GBCC) Exec. Dir. Jill Boullion, and GBCC chair Bill Franks. 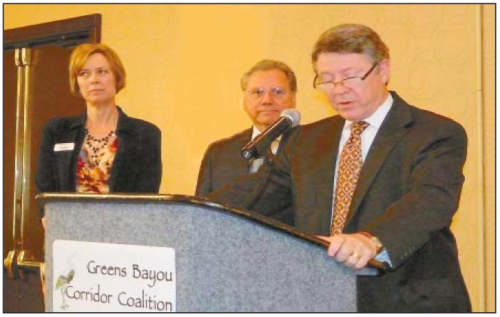 HOUSTON – The Greens Bayou Corridor Coalition (BGCC) held its annual report to the public, with a keynote address from County Judge Ed Emmett, and remarks from Houston Mayor Annise Parker last Thursday, March 20. Chairman Bill Franks acted as Master of Ceremonies, and Executive Director Jill Boullion presented an overview video on the state of the coalition and its accomplishments in the last year. Boullion had a lot to present, as the Coalition currently has about 40 projects, taking place in four distinct areas or “reaches” around the North and East sections of the County. The Coalition partners with a number of other organizations to accomplish its work, and this idea led to Emmett’s keynote theme, partnerships. Boullion pointed out that the Coalition covers approximately 45 miles in length, and its goals are recreation, economic development, and enhanced quality of life. In addition, it works to remediate flooding and other threats to the bayous. GBCC is concerned with Greens Bayou, Halls Bayou, Garners Bayou and Reinhardt Bayou. GBCC is funded by memberships and grants. It works with the help of the National Park Service, Texas Parks & Wildlife, and a number of corporate and organizational sponsors. In his keynote address, Emmett expanded on his State of the County theme of Cooperation and Consolidation with other governmental or corporate entities, to create controlling groups that can accomplish more than working alone. Emmett said that because of the extreme population and economic growth of the county, and the region, we must have governments that can respond and control in a more regional basis. Priorities for these will be infrastructure, including transportation, parks, and waterways. He championed the idea of joint government entities, for city + county + subdivisions. He said that current coalition government bodies, such as the flood control district and Metro, could be expanded and more coordinated, to help meet the region’s needs. He acknowledged that some consolidation ideas would be difficult, such as law enforcement, but were needed. Other regional issues, he offered, were Healthcare and county boundaries. I applaud all the fine efforts and plans to make better use of these natural resources. Also, having suffered flooding in 2001, I wish to see much greater improvement in drainage from the bayous surrounding the Wood Bayou subdivision and others. Having walked many times into some of the wooded areas involved around the bayous, I have a concern which wasn’t addressed; with new parks created, without adequate policing the likelihood is they will become havens for transients. This is not simply conjecture, as I have seen ‘evidence’ on numerous occasions of people living in these wooded areas. Without some thought given to that problem, which is likely to worsen, my fear is that those parks and float trails might become undesirable to families and others for whom they were intended. It is well published fact about assaults on hikers and bikers in other Houston and Harris County established parks. This would seem a fine opportunity to incorporate extra, special patrols, additional lighting, and electronic security measures into the advance planning. Shouldn’t it be a goal of the city/county to make these new community facilities the SAFEST recreation areas of ANY municipal area? Would that not be a tremendous ‘feather in the cap’ of local leaders, real estate and business interests, public relations, local Chambers of Commerce, and tourist boards?